Samsung has been spotted promoting the Galaxy Note 9 ₹ 67,650 using an iPhone. The latest incident comes a long time after Spanish tennis player David Ferrer who was roped by the South Korean giant harped about the Galaxy S4 apparently using an iPhone. Samsung’s official Twitter account in Nigeria has now found sharing a tweet about the Super AMOLED display of the Galaxy Note 9 that was found to be posted not through a Galaxy smartphone but using Twitter for iPhone. 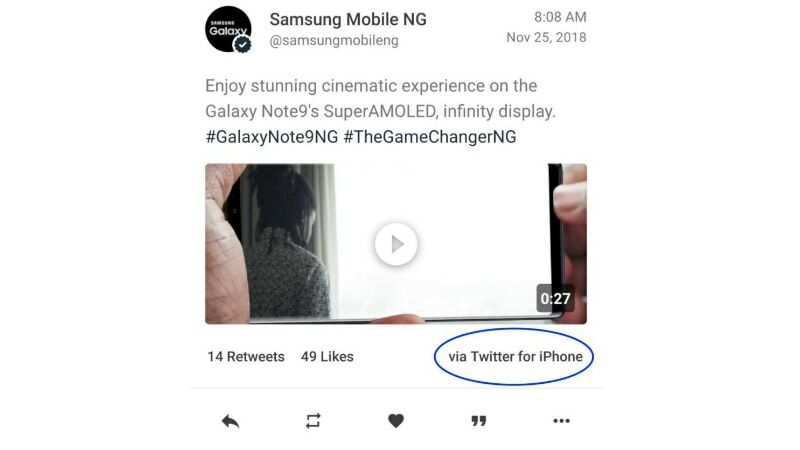 As first spotted by tech reviewer Marques Brownlee who’s renowned for his YouTube channel MKBHD, the Samsung Mobile Nigeria account on November 25 posted a tweet that was apparently produced using the Twitter for iPhone app, which is exclusive for iPhone. The tweet in question was notably highlighting the display panel of the Galaxy Note 9 that is competing against the iPhone XS Max. Since it’s been noticed on Sunday, the alleged tweet has been pulled down. Brownlee reported that shortly after he highlighted the flaw by its digital marketing team, Samsung even removed its Nigerian Twitter account. However, at the time of filing this story, the account was live, though the tweet wasn’t able for reference. This isn’t the first time when Samsung’s digital marketing team has been caught using an iPhone to promote Galaxy smartphones. Earlier this month, the official Samsung Saudi account made a similar mistake and allegedly used an iPhone to post a promotional tweet about the Galaxy Note 9. Also recently, Samsung filed a lawsuit against its brand ambassador in Russia – Ksenia Sobchak – for using an iPhone X ₹ 74,000 on television, despite being contractually obligated to use a Samsung smartphone in public. Spanish tennis player David Ferrer who was roped as a brand ambassador by Samsung in the past was also spotted praising the Galaxy S4 using an iPhone.